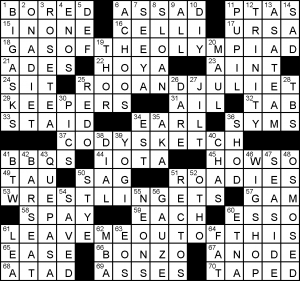 Congrats to Team Fiend’s Laura, who is the newest member of the American Values Club crossword collective! You can subscribe, buy individual puzzles, or find out how to get a free trial subscription here. Sometimes I’ll grouse about seeing the same byline pretty soon after the last time that person had a puzzle in the same venue—but I was pleased to see another Robyn themeless two weeks after her prior Friday NYT (that one had a cute mini-theme). Plus, her byline is cool because the name Robyn Weintraub is “supervocalic”—it includes each vowel (including the Y, for a bonus) exactly once. This puzzle won me over right away with the gimme at 1a. [Dreamhouse resident], BARBIE DOLL. My sister and I had the version that was a three-story dwelling with no stairs, just a string-operated elevator to get from one floor to another. And then Robyn threw some things at me that were harder to suss out. I wasn’t familiar with the term 53a. [Like cooking that goes whole hog? ], NOSE TO TAIL—eww. 45a [Sword grips], you never know if it’s HILTS or HAFTS till the crossings fill in. I didn’t know DEWARS scotch was a 7d. [Bacardi brand]. But most of the puzzle was more in my wheelhouse, and I liked it. AVERAGE JOE, a LIVING WAGE, ERITREA, ROLLER RINK, CROSSBONES, IN RARE FORM, SEA TURTLES, Himalayan PINK SALT, and START SMALL were all nice additions to the grid. 36a. [Israeli-born Jew], SABRA. 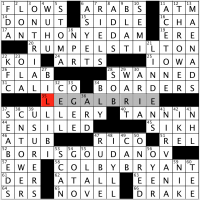 This is a word I learned long ago from crosswords. Today, I see it more often in the grocery store, as a major hummus brand (I’m a Cedars hummus proponent myself). 39a. [Chad’s place], BALLOT. Did you want AFRICA here? I sure did. 4d. [One who’s happy about acquiring a few extra pounds, informally], BRIT. In Britain, pounds are money and stone are a unit of weight. Why you’d want to use a unit of measure as big as 14 lb as your basic weight unit, I can’t say. 5d. [Janis with the 1975 hit “At Seventeen”], IAN. Janis Ian is still performing, and she’s on Twitter as an engaged citizen as well. Here’s the song (below), which I somehow don’t remember at all from my childhood. 43d. [Five-letter capital written as two words in its native language], HANOI / 38d. [Language similar to Thai], LAO. Speaking of Thai and national capitals written as multiple words, did you know that Bangkok is called Krung Thep Maha Nakhon in Thailand? You’re probably wondering what they call Washington, D.C. in Thailand now. I can’t read Thai, but here’s the Thai Wikipedia page on Washington. Four stars from me. The ENOL couldn’t overpower the BARBIE Dreamhouse vibe. [17a: Cheesy prime minister of England? ]: ANTHONY EDAM. Anthony Eden served as PM from 1955 to 1957, and was in a position to advise the young Queen Elizabeth II during the early years of her reign. Jeremy Northam plays him in The Crown. Edam is a Dutch rinded cheese that you know from crossword grids. [20a: Cheesy imp in the Brothers Grimm? ]: RUMPELSTILTON. Rumpelstiltskin. Naomi Novik, one of my favorite fantasy writers, has a new novel out called Spinning Silver, which is based on the Rumpelstiltskin tale. Stilton is a blue-veined cheese from the English Midlands. It’s tasty. [35a: Cheesy written argument? ]: LEGAL BRIE. Legal brief. Some varieties of soft French cheese, such as brie, are illegal to import into the United States. [52a: Cheesy Pushkin play? ]: BORIS GOUDANOV. Boris Godunov, written in the 1820s, is a play about the 16th-century tsar/czar of Russia of the same name. 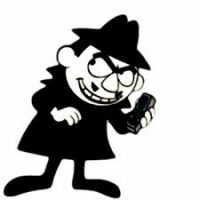 You may remember his counterpart, Boris Badanov from the Rocky and Bullwinkle cartoons. Gouda, like edam, is a mild Dutch rinded cheese. It’s gouda nuff to eat! [58a: Cheesy basketball legend? ]: COLBY BRYANT. Kobe Bryant played for the LA Lakers for twenty years, retiring in 2016. Colby is a type of cheddar made in the cheesy state of Wisconsin. At souvenir shops in Wisconsin, you can buy many items, including Colby cheddar, in the shape of Wisconsin. [27a: Cream soup with mussels]: BILLI BI. I saw a recipe for this years ago in Barbara Kafka’s cookbook, Soup: A Way of Life (note: Soup is a way of life with which I am down), and have never seen it anywhere else, until today. It’s funny, but it feels like for me that letter deletion themes are a lot harder to make “land” than letter addition ones. The answers just looked weird as I fill them in, so I solved around them. It doesn’t help that WRESTLING(ME)ETS really looks like it wants to be MATS. As the revealer, 16 letter LEAVEMEOUTOFTHIS, suggests, a ME has been subtracted from four theme answers. GA(ME)SOFTHEOLYMPIAD, RO(ME)OANDJULIET, CO(ME)DYSKETCH. Two of the new words made were names, which suggests this was difficult to make work. [Is not wrong? ], AINT. I didn’t realise there was anything wrong with that. I tried AMNT. [Fix, as a toy], SPAY. Really tiny dogs are stressful to anaesthetise. Tiny cats on the other hand… usually no sweat (I may regret saying that). [Losing purposely], ONADIET. Good deke, though I suspect I’ve seen it before. [Handy initials], DIY. Not WCH. [Star __], PUPIL. That is a really unhelpful (and uninteresting) clue. This entry was posted in Daily Puzzles and tagged Bruce Haight, Jim Leeds, Robyn Weintraub. Bookmark the permalink. 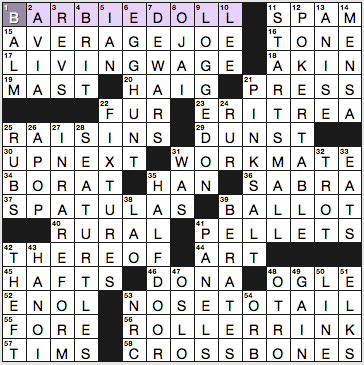 NYT: That NW corner was awesome: BARBIE DOLL and AVERAGE JOE on a LIVING WAGE. You can smell trouble a mile away! Agree on the NW corner. It defeated me. Very cute CHE. Thanks for the fruity reminiscence, Huda. I made a colossal mess of this one, starting with 1A. My father’s bookcase had a book that I thought was titled Mr. Blanders Builds his Dream House. It turned out it was Blandings, which was also a movie with Cary Grant and Myrna Loy. It took me a long time to unravel the NW and that was one of the easier sections. I didn’t know ANISE even though my kids love pho. It seemed that I screwed something up in every section. One of my slowest times in recent memory. Thank you Amy for vocalizing (or writing) something I have oft wondered but never asked. Now the universe must answer. As someone who has virtually no discrimination about anything and can only count up to 20, 14lbs seems to be a perfectly good unit of weight. Further, if you’re on a diet, would you rather fret about gaining a full pound or .06 stone? .06 stone is rounding error. My last square was the R crossing BERATES and ART, the latter was a headscratcher until I realized the “oil” part of “Getty oil” was referring to a piece of art at the Getty museum. Great clue! Loved today’s NYT. “Nose-to-tail” was a gimme because we watch “Chopped.” I didn’t have a Dreamhouse. I do very much remember “At Seventeen.” I’m older than Amy, I sing alto (like Janis Ian) and I ADORED that song. Yes, I was laughing about Amy saying she didn’t remember the song. DNF for me today. Took a very long time to get BARBIEDOLL, but figured it out eventually. But I came to grief on WORKMATE — I had LOGGEDIN (which always seems more natural to me than LOGGEDON), and went with PINESALT, because why the heck not. That left me with WIREMATE, which was clearly incorrect, but I couldn’t puzzle out the problem. Incidentally, EATS for ‘Chuck wagon fixin’s” seems wrong to me. EATS refers to grub or chow in general, so in this case it would be your entree-equivalent, the BBQ ribs or whatever, while the fixin’s are slaw, potato salad, and other side dishes. On the question of why use ‘stone’ as a measure of weight, I can only say, why not? It’s not used today for anything but body weight, but originally it was a tradesman’s measure, for anything from spices to grain to raw wool to livestock. I was lucky I was stuck in one place doing this puzzle for a while, as the section David L talks about gave me my last trouble. I did exactly the same things as David, step by step. But then I decided to try out other vowels after “W” and I finally got the very fine WORKMATE, along with PINK SALT. A very nice puzzle, and easier than usual overall, made easier by a “feminine” orientation for a change. Bangkok is often cited as the place with the longest official name in the world (https://en.wikipedia.org/wiki/List_of_long_place_names), though most people there just refer to it as “Grung Thep.” The Thai Wikipedia page just calls our capital “Grung Washington D. C.,” which I suppose is slightly longer than what we call it. We could just call it Grunge. I know several Thai and Cambodian women. Some of them are ethnically Chinese. Most of the ones I know are roughly 5′ tall and weigh less than 100 lbs. Almost all of them have surnames of 12 or more letters. I have always found this to be humorous. There are even websites answering the question why Thai names are so long. In the British Open, one Thai player who unfortunately did not make the cut is named Jazz (his father loves jazz) Janewattananond. Thai director Apichatpong Weerasethakul is one of the leading filmmakers working today. He’s #4 on this TSPDT list. He also goes by Joe. a bit of a quibble on 37a. if i asked “what do you use to get olives out of the jar”, would you say forks or a fork? In order to use spatulaS, you would need (knead? :) ) several different batters all at once. Cute CHEesy puns; thanks for the explanations and background for the wordplay. (If you want to by GOUDA in the Netherlands, remember it rhymes not with “Buddha” but with another creamy seafood soup, New England clam “chowda”. Also the G is as in the ch of Bach or loch, only worse ;-) .) I didn’t know either 37D:BILLI_BI or Nellie 37D:BLY, so had a double guess for the equally unfamiliar 37A:SCULLERY, but fortunately got both of them right. P.S. Some years ago a local supermarket actually listed “Harvarti cheese” in its deli menu . . .